We make backyard memories. The staff at Vantage Pools and Spas Inc have over 30 years experience in pool building; our installer has 30 years worth of satisfied happy clients that are eager to show off their Vantage Pool.We are a family business and believe that good business means building relationships. Our friendly professional staff is always happy to help with your pool & hot tub needs whether it’s through our social media, in your backyard, or in our retail store here in Langley. Our office staff is always willing to answer whatever questions you can throw at us. We also have a service department that can do the work that you don’t want to.You can feel confident knowing that the expertise of Vantage Pools and Spas is available to you before, during and after your pool or spa installation. Vantage Pools and Spas is a proud member of the Elite Pool Program, LeisureScapes Group, and the Better Business Bureau. 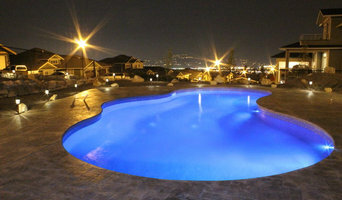 Our focus is YOU the client so our poolscapes are custom designed for your enjoyment. 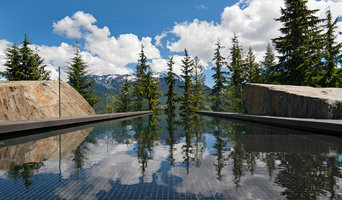 We've been building quality poolscapes in BC for over 50 years. Proud members of the Master Pools Guild since 1978 and winner of many National and International awards throughout our history. Winner of the Best of Canada award from Canadian Business Executive for 2015. Welcome to BC POOLS! For over 8 years now, we have been serving the lower mainland of Beautiful British Colombia with recent projects as far as the sunny Okanagan. We strive to offer the highest standard of quality work and customer service. With us, your dream to have your own private oasis is in sure hands. We take pride in Creating Your Happy Place. All Star Pools is locally owned an operated on Vancouver Island, BC. Lorenzo has been building pools since 1985. Originally from Ontario, he moved out West in 2003 continuing to live out his passion for those in search of the perfect backyard oasis, in both Vancouver and Victoria, as well as the surrounding areas. Lorenzo is your ‘hands on’ pool guy right from the initial design, through all aspects of construction and then with ongoing service and maintenance. We are old school with a personal touch. We prefer to meet with you in person, discuss your ideas, and make sure what you want will work for you and your family for the purpose you are intending. We won’t stop until you're happy and our team will work with you to make it right. We help you plan for growth and long lasting enjoyment out of your purchase. We can work within any budget, no project is too big or small. Hot Tub & Swim Spa Manufacturer since 1996. Over 200 Coast Spas Dealers Worldwide, find your nearest dealer at www.coastspas.com. Coast Spas is ISO 9001:2015 Certified which is the highest internationally recognized quality standard for manufacturing. Hydro Cyclonic Filtration, Strong Shells, 24" Waterfall and Infinity Edge Hot Tubs & Swim Spas are just a few of Coast Spas exclusive features. Taylor's Backyard Center is the retail division of Taylor Industries. Taylor Industries is a Washington State small-business founded by Bob and Debra Taylor in 1994. Bob Taylor has worked-in, or been part of, every segment of the backyard industry. Starting as a chemical production manager in the min 80's, advancing to operations manager, and eventually starting a spa manufacturing company in 1987, in Ontario, Canada. Bob moved his family back briefly to British Columbia in 1995 and Lynden, Washington. Bob started Taylor's and built custom spas, pools, and backyards. We expanded our product offerings as the years passed by, always striving to give our customers the best products, service, and experiences. We expanded our retail division in 2007 by opening a larger, state-of-the-art store to display the vast product catalog we offer. By 2010, Taylor's was creating backyards, shipping products, and offering technical service and advice in 3 northwestern states and 3 western provinces with a staff of 5 full-time, 5 seasonal employees. In 2011, Taylor's contracted Jesse Taylor, Bob's oldest son, to design, construct, develop, and manage a new venture into online sales. Taylor's has always sought to offer the best products, pricing, and personalized service to the online marketplace. This new venture online enables us to share our knowledge to even more people across North America. We're proud to introduce to you, our long-term clients, friends, and family; and our new clients Taylor's Backyard Center online. Please let us know how we make this new venture better for everyone. At Orca Pool & Spa, we take enormous pride in providing the best pool and spa installs and service in Vancouver and the Lower Mainland. Below is an intro to our team – give us a call to let us help you create or improve your backyard oasis. We look forward to hearing from you and earning the privilege of calling you our client and friend! The experts at CA Pools can help you to design and build the perfect swimming pool for your backyard escape. You can rest assured that you’re in the right hands as we transform your backyard into the beautiful outdoor living space you’ve always wanted. 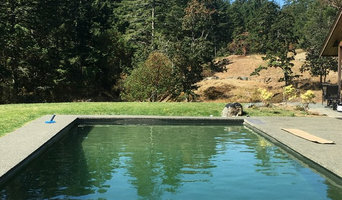 We provide swimming pool design, construction and installation services all across Vancouver Island. Our innovative turn-key projects and award-winning services for pool renovations set us above the rest. We offer the most advanced technology in all aspects of our swimming pools and products A custom inground swimming pool might be the missing piece to completing your backyard living space. You can surround yourself with beauty and luxury with a vanishing edge pool that will take your breath away, or a Swin Jet system to help with all your therapeutic/athletic needs. Years of experience has led CA Pools to be an industry leader across Vancouver Island. We can even provide you with your dream backyard by leading projects that involve reinstalling or resurfacing an existing swimming pool. Aloha Pools (& Waterscapes) Ltd.
National and International award winning Swimming Pool, Spa and Water Feature construction company. Family owned and operated from Vancouver, BC Canada for over 40 years and operating throughout British Columbia. Specializing in custom concrete structures limited only by the client and designers' imaginations. G&T Pool & Spa Contracting Ltd.
G&T Pool & Spa Contracting Ltd. has been servicing the Sea to Sky corridor and Greater Vancouver area commercially and residentially since 1992.We are committed to exceed customer expectations by providing expert advise, innovative idea's and high quality work. Pool Shark Pool Services is the right choice in Vinyl Liner Swimming Pool construction. With 36 years in the Pool Industry, our focus is in quality Custom Pool Construction and Liner Replacements at an affordable rate. Our experienced and knowledgeable crew can provide all your Pool Construction and Repair needs to make your home an Oasis of the neighborhood. Pool Shark Pool Service excels in Sales and Service for In Ground and Above Ground Pools; Spas; Equipment; Chemicals; Decking; Plumbing and more. Courteous, On-Time and On-Budget is our motto when creating your Backyard Resort. Conveniently located in the Keating industrial area in Saanichton ( Greater Victoria ) British Columbia, Skyview Industries has been serving Vancouver Island for over 25 Years with a philosophy of providing homeowners with the best products, price and service. For homeowners who want to fully enjoy the indoor-outdoor possibilities of their home, we have more than a few great ideas. From awnings and canopies to skylights and sunrooms - not to mention terrific self-cleaning hot tubs and swimspas, we can show you the possibilities awaiting for your home. With hot tubs, energy-efficiency, longevity and ease of maintenance are key, and our Hydropool Self-Cleaning Hot Tub is quiet literally the world's easiest hot tub to maintain. The technologically advanced self-cleaning system simultaneously removes surface debris and cleans the bottom of the tub with its built-in floor vacuum, fully cleaning the water every 15 minutes. Where foam-insulated hot tubs can prove challenging (see Mark Fell Blog), the Hydropool Hot Tubs and their Swim Spas - the pool "you didn't think you could afford" - are among the most energy-efficient on the market. And because of their somewhat unique design, the Hydropool products allow for easy maintenance. Looking to enjoy your hot tub or swim spa no matter the weather? Skyview can help you with that, too! Our low-maintenance awning, canopies and sunrooms allow homeowners greater use of their homes and gardens, with quality and affordability. Available in a variety of sizes and styles, our awnings and canopies can be converted to a sunroom / garden room and partially or fully enclosed in the future. Inside the home, skylights can increase natural light and offer both practical and aesthetic benefits - improving moods, boosting energy and increasing production levels, while reducing eyestrain and converting electricity. From a design perspective, natural light also makes interior spaces appear larger and renders colours true. Skyview's products block the sun's damaging UV rays, and will never fade, fray, tear or dent, and the solar bronze tinting allows up to a 45-per-cent-reduction in heat gain and glare! American Pools is a family-owned and operated company with over 40 years of experience in custom concrete pools, spas and water features for both residential and commercial clients. Backed by the highest of service standards, our in-house team of experienced, expert builders and craftsmen are dedicated to fulfilling our client's needs and expectations for their perfect pool creation. Our European roots and leading-edge techniques have made American Pools an industry leader with long-standing relationships with past clientele, premier architects, designers, engineers and homebuilders in BC. Whether it's a new pool construction or a renovation, American Pools is committed to delivering superior design, quality craftsmanship, professional service and customer satisfaction. If you’ve been dreaming of relaxing summer days spent poolside, it may be time to consider hiring a Panorama Park pool builder. A professional can not only help with design and pool installation, but also aid in appropriate maintenance once it’s complete. Whether you're at the beginning stages of planning or want to revamp your existing pool, a pool company in Panorama Park, BC will be able to get you on the right track. What exactly do Panorama Park pool builders do? If you are planning for a new pool in Panorama Park, BC, a swimming pool builder will analyze your outdoor space and your aesthetic wishes to determine an appropriate design for your yard, installing it once the plan is developed and approved. Once installed, some pool companies in Panorama Park, BC can handle the necessary cleanings, water testing, renovations and equipment replacement or repairs for your pool or spa. If not, many can also suggest Panorama Park, BC swimming pool contractors or maintenance services to help with upkeep or repairs down the road. Here are some related professionals and vendors to complement the work of swimming pool builders: Garden & Landscape Supplies, Landscape Architects & Landscape Designers, General Contractors, Landscape Contractors, Solar Energy Contractors. Before hiring a swimming pool construction company to create your new Panorama Park, BC pool, determine how you'll be using it. Will it be for fun or for lap exercise? Will the primary users be children, adults or a mix of the two? Knowing the use can help you find Panorama Park pool builders who shares your aesthetic. Once you find swimming pool builders in Panorama Park, BC who share your style, research is critical. Review customer references and comments, collect at least three to four estimates to compare, meet with potential Panorama Park pool designers and builders in person and ensure that they are British Columbia certified service professionals and licensed with the registrar of contractors before making any final decisions. In addition, get a sense whether they plan to complete the pool installation and be done with it, or whether they seem interested in building a long-term relationship with you. Be wary of the former: it's likely a reflection on the level of quality of the pool construction they do. Find a Panorama Park pool contractor or designer on Houzz. Narrow your search in the Professionals section of the website to pool builders in Panorama Park, BC. You can also look through Panorama Park, BC photos by style to find a pool or spa you like, then contact the local pool company who designed it.